Roxie is a 1 1/2 year old white female pit bull. 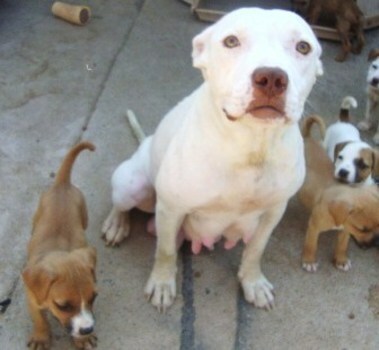 Roxie came to us from a shelter with her babies which are doing good. Roxie is a great dog that is very smart, she sometimes is a little timid and unsure of someone when she first meets them, but once she realizes that someone is not going to hurt her she warms right up to them. Roxie is doing a great job adjusting to her new surroundings and has a great personality. Roxie is going to be a medium size dog that gets around 40 pounds full grown. Roxie does well around children, and as far as getting along with other dogs we are slowly working with her on that. Roxie is crate trained, and is going to be a great dog for someone to adopt. Roxie will come up to date on shots, spayed, microchipped, and on heartworm preventative. If one is interested in adopting Roxie please fill out the application above. ROXIE’S ADOPTION FEE-$150.00 Reviewed & Updated: 09-12-2010 Roxie is exclusively fed Natural Balance Ultra Premium Dog Food!